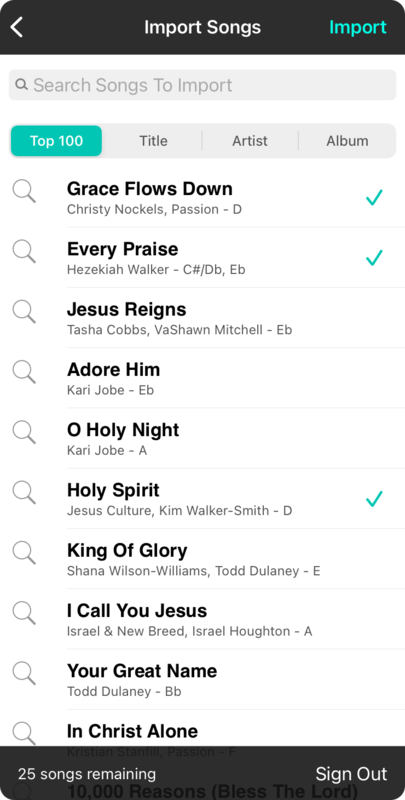 WorshipReady.com provides handcrafted chord charts for use on a number of platforms including Planning Center, PDF, and OnSong. Access to content is through subscription only and limits the number of chord charts you can download per month based on your subscription level. The first time you access this import screen, you'll need to sign in. Enter your credentials to view chord charts. By default, the top 100 songs are listed on the screen. Use the search bar to search songs by title. You can also use the buttons below the search bar to search by artist and album as well. Tap on the magnifying glass icon on the left side to see a preview of the song prior to importing it. This does not count against your downloads. Make sure it's the song you want before importing it into your library. Tap on the songs that you want to import to place a checkmark on the right side. Once you've selected songs to import, tap on the Import button in the upper right side of the screen. The progress of the import will be displayed. Once finished, the number of downloads available will decrease and you will be returned to the All Songs screen. Note: You will only be able to checkmark the number of songs that you have available to download. You can use the Sign Out link at the bottom to sign out of WorshipReady.com at any time.